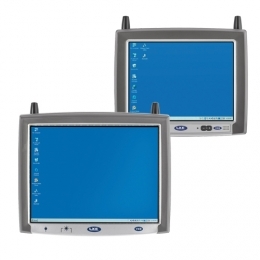 With the VX8 and VX9 terminals from Honeywell, formerly LXE, you get robust mobile computers for vehicle mounting, for example onto forklifts. The strengthened magnesium housing makes them tough and the large touch screens guarantee reliable operation, even under demanding conditions. The VX9 is IP54-certified, and the VX8 is IP65-certified, allowing them to withstand water, dust and other foreign particles. Decide between the Intel Core 2 Duo processor with 1.5 GHz and the Intel Atom with 1.6 GHz. An additional graphics processor, as well as 1 GB RAM ensure for ideal presentation, even in more demanding applications. Both terminals come standard equipped with 802.11 a/b/g Wi-Fi and transmit data wirelessly to the server or other network devices. There are an n-Standard module, WWAN and Bluetooth optionally available for both models. The operating system Windows 7, Windows XP or Windows Embedded Standard 2009 is pre-installed. Optionally, both models are available in outdoor or cold storage versions.